Nonnecke, I.l.. "Vegetable". The Canadian Encyclopedia, 04 March 2015, Historica Canada. https://www.thecanadianencyclopedia.ca/en/article/vegetable. Accessed 21 April 2019. 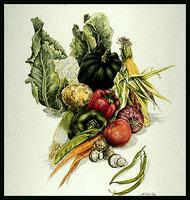 A vegetable is a herbaceous plant of which all or a part is eaten, raw or cooked. 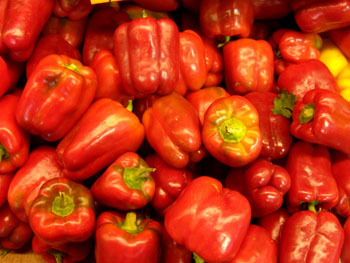 Vegetables are a valuable source of protein, vitamins, minerals, trace elements and fibre. All vegetables are high in carbohydrates, which contribute to their unique taste. Some common vegetables grown in Canada (artwork by Claire Tremblay). A vegetable is a herbaceous plant of which all or a part is eaten, raw or cooked. Vegetables are a valuable source of protein, vitamins, minerals, trace elements and fibre. All vegetables are high in carbohydrates, which contribute to their unique taste. They are most prized when eaten shortly after harvest, either fresh or cooked. In Canada, at least 53 species or botanical varieties of vegetables are grown: one is a mushroom; 52 are seed plants (listed below according to family grouping). Gramineae (grass family): Zea mays var. praecox, popcorn; Z. mays var. rugosa, sweet CORN. (Lily family): Asparagus officinalis, asparagus. Amaryllidaceae (amaryllis family): Allium cepa, onion; A. cepa (Aggregatum Group), shallot; A. ampeloprasum, leek; A. sativum, garlic; A. fistulosum, Welsh onion; A. schoenoprasum, chive. Polygonaceae (buckwheat family): Rheum rhabarbarum, rhubarb. Chenopodiaceae (goosefoot family): Beta vulgaris, beet; B. vulgaris (Cicla Group), chard; Spinacia oleracea, spinach. Cruciferae (mustard family): Brassica oleracea (Acephala Group), kale and collards; B. oleracea (Gemmifera Group), brussels sprouts; B. oleracea (Capitata Group), cabbage; B. oleracea (Botrytis Group), broccoli, cauliflower; B. oleracea (Gongylodes Group), kohlrabi; B. napus (Napobrassica Group), rutabaga or swede; B. juncea, mustard greens; B. rapa (Rapifera Group), turnip; B. rapa (Pekinensis Group), pe-tsai Chinese cabbage; B. rapa (Chinensis Group), pakchoi Chinese cabbage; Nasturtium officinale, watercress; Amoracia rusticana, horseradish; Raphanus sativus, radish. Leguminosae (pea or pulse family): Pisum sativum, garden pea; P. sativum var. arvense, field pea; P. sativum var. macrocarpon, edible-podded pea; Vicia faba, broad or faba bean; Phaseolus vulgaris, green bean; P. coccineus, scarlet runner bean; P. limensis, Lima bean; Vigna radiata, mung bean. Umbelliferae (parsley family): Daucus carota var. sativus, carrot; Foeniculum vulgare, fennel; Petroselinum crispum, parsley; Apium graveolens var. dulce, celery; A. graveolens var. rapaceum, celeriac; Pastinaca sativa, parsnip. Solanaceae (nightshade family): Solanum tuberosum, potato; S. melongena, eggplant; Lycopersicon esculentum, tomato; Capsicum annuum (Cerasiforme Group), pepper. Cucurbitaceae (gourd family): Cucurbita pepo var. pepo, pumpkin, acorn squash; C. pepo var. melopepo, bush summer squash; C. maxima, winter squash; C. moschata, winter crookneck squash; Citrullus lanatus, watermelon; Cucumis sativus, cucumber; Cucumis melo var. cantalupensis, cantaloupe; Cucumis melo (Reticulatus Group), muskmelon. Compositae (composite family): Cichorium intybus, witloof, chicory; C. endivia, endive; Tragopogon porrifolius, salsify; Lactuca sativa, lettuce; Helianthus tuberosus, Jerusalem artichoke; Taraxacum officinale, dandelion. Only about 16 of the species listed are widely grown in Canada; 5 or 6 species account for the bulk of all vegetables produced. Vegetables are sometimes classified as cool-season and warm-season types or by their edible parts: for example, flowers - cauliflower, broccoli; leaves - cabbage, lettuce, spinach; shoots - asparagus; leaf stalk (petiole) - rhubarb, chard; roots - beet, carrot, potato, onion; fruit - tomato, pepper, squash. Vegetable production ranges from highly intensive row cropping to very extensive types of production. Although good soil is beneficial, the grower often finds it more important to use light sandy soils in order to get an early start on the season. Vegetable crops recover from seasonal or short-period droughts less efficiently than most other horticultural crops; thus, a source of water for irrigation during dry spells is necessary. All vegetable-growing operations, from precision seeding to ultimate harvest, handling and packaging, are rapidly becoming fully mechanized. Every mechanical or chemical weed -control method is used. Insects and plant diseases are closely monitored, and crop losses are minimized by use of chemical pesticides. Many growers have built storage facilities for long-term storage of crops such as potatoes, onions, carrots and cabbages. Canada's long winter season makes it imperative that all vegetables capable of storage in the living state be stored in prime condition. The potato is the most widely cultivated vegetable in Canada. Excluding potatoes, Ontario ranks first in vegetable production, both in yield and area; Québec comes second, followed by BC, the Prairie region and the Atlantic region. Ontario also has the greatest potential for increasing production. When potato production is included, Ontario is still in front, but the Atlantic region is second, followed by Québec, the Prairie region and BC. Relatively few sites in Canada have the moderate, reasonably long growing season necessary for vegetable production. Moving from W to E these areas are the lower Fraser Valley, BC; the irrigated area of southern Alberta; the Red and Assiniboine river valleys of Manitoba; the southern Great Lakes rim area of Ontario; the St Lawrence Valley and the muck areas of SW Québec; the St John River Valley, NB; the Annapolis Valley, NS; and most of PEI. Canadian yields of vegetable crops are comparable to those of similar crops grown in the US or Europe. However, unlike our southern neighbours, we grow only a single vegetable crop on the same land in a year; therefore, total yields usually reflect only one harvest. We compensate by growing vegetables in greenhouses, where our yields of tomatoes and cucumbers are as high as those anywhere in the world. In Canada, maximum yields of carrots, onions, cabbage, celery and lettuce are obtained from muck or organic soils, where adequate summer heat prevails. Upland soils for similar crops are slightly less productive, because the water supply is not usually as constant as on muck. Examples of good yields of major crops would range as follows: potatoes, 9-16 t; tomatoes, 18-23 t; canning peas, 1-2 t; sweet corn, 4-5 t; carrots and onions, 16-20 t.
Canada produces over 1 million metric tonnes of vegetables for fresh market annually (excluding potatoes, mushrooms and greenhouse vegetables), worth about $600 million at the farm gate. Unlike many other agricultural products, their value increases 5-7 fold as the farm-gate value is increased by grading, washing, packaging, transportation, wholesaling and eventual retailing. Whenever vegetables are not immediately consumed, they should be rapidly cooled to retard loss of quality. If summer or field heat is not quickly reduced, vegetables soon lose their desirability. To retain maximum taste and food value, vegetables can be hydrocooled, vacuum cooled, covered with ice, canned or processed, quick-frozen after a brief blanching period and stored, freeze-dried to remove all water in the tissue, or dehydrated under high temperatures. In addition, vegetables handled by any of these means can also be converted to soups, chips, condiments or flakes. Managers of produce departments of modern supermarkets recognize that well-handled, attractively displayed produce carries the greatest unit profit in the store.